Folded programme and map for the British Empire Exhibition 1924, Wembley, London. Printed with a map of the exhibition on one side. 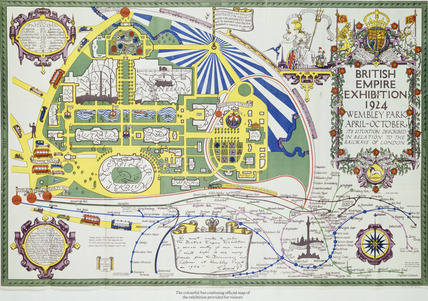 This programme and map were produced for the British Empire exhibition held in Wembley Park from April to October 1924. The exhibition was intended to celebrate the empire and 'to stimulate trade, strengthen bonds that bind mother Country to her Sister States and Daughters, to bring into closer contact the one with each other, to enable all who owe allegiance to the British flag to meet on common ground and learn to know each other'. The programme includes a map of the site and descriptions of the exhibition pavilions.